Right. Let’s do this by first running through the Vestrucci style and cut, and then going into the more subjective areas of reaction and experience. The suit being discussed is a Holland & Sherry charcoal flannel that I had made over the past 9 months, and was covered previously here. Shot at home, in slightly moody lighting, by Jamie. The style of the jacket is most obviously Florentine (Loris Vestrucci was trained by Giuntini, among others, who was one of the last great Florentine tailors). This style, which Tommaso and Tommaso at Vestrucci describe as 'Italian character with English modesty', is an effective way of combining comfort and masculinity. The make is soft and that, combined with the drape, make it very comfortable. But the large lapel and extended shoulder give an impression of strength and size that is rather flattering. The Italian side is perhaps most seen in that flair of lapel and general curviness, and the English in the closed quarters and general subtlety. The obvious comparison is with Liverano, which readers will be more familiar with as an example of Florentine style. Overall it feels like a less striking style - softer and rounder - but still with that masculinity in the shoulders and lapel. I particularly like the image above as an illustration of this. 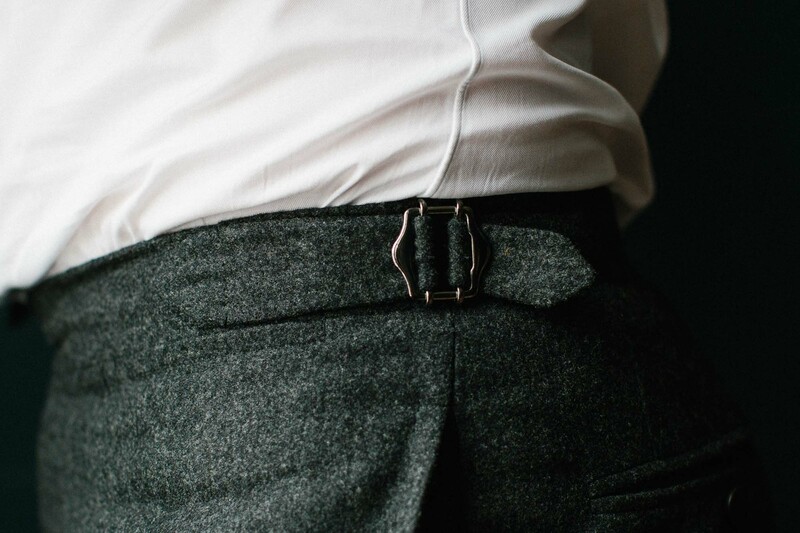 You can clearly follow the line of the slightly convex lapel, into a relatively long and straight line through the waist button, and then the little curve at the bottom. There is little to say about the style of the trousers, except that Loris likes a rather long fly. This has the advantage of opening up more, making the trousers easier to get on. But makes little noticeable difference to the look. I've been wearing the suit for the past couple of months, and I have got very used to its softness, drape and general comfort. It reminds me most of a lighter and softer Anderson & Sheppard. Both have that extended shoulder and drape, and I can happily sit and work in both all day. A&S just has more padding and canvas. The only area of the Vestrucci I would like more structure is the trouser waistband, which has a very soft, folded over lining. This would be more attractive, and no less comfortable I think, with something thicker. The make is good without approaching the fineness of anyone further north, in Milan, Paris or London. Nice buttonholes but not super-fine, and good finishing inside without any of the flair of a Cifonelli or Camps de Luca. My experience too, was good. Tommaso Capozzoli measured me in London, and apart from one or two small issues, it was a good base for Loris to work from in Florence. I had one fitting there late last year, and then another in January during Pitti. I feel this consistency and accuracy should be emphasised given recent discussions - Vestrucci is still a small tailor, but has the professionalism of a large one. The only outstanding issue we have is a small one with the trousers. The rise was initially too high, and although it has been reduced, it still needs to be a little more. I might also look at the drape in the back of the jacket (don't have a picture of that, sorry) as it is more than the front, and could perhaps be cleaned up and still be comfortable. I'll look at both with Loris and Tommaso next time I'm in Florence. Vestrucci don't do trunk shows to London at the moment but are considering it for later in the year. They are already in the US of course, with the base of the Stefano Bemer showroom on 67th street (Stefano Bemer shoemakers owns Sartoria Vestrucci). I should also mention that Vestrucci offer a ready-to-wear and made-to-order service, which is made to the same cut and style as the bespoke, but of course not the same quality level. This may prove helpful for anyone that likes the style, as the bespoke is fairly expensive, at €4,200 for a jacket and €5,000 for a suit. The MTO is €1,800 and €2,400, the RTW €1,500 and €2,000. I had a Polo Ralph Lauren one when I was younger, and loved the style. The flannel is so dark that it feels smart and serious, yet the texture is unexpected in most smart or professional environments. I'd generally wear it with black shoes (which is why I went for grey corozo buttons, not brown), and it's nice with a white shirt and a tie, as here. 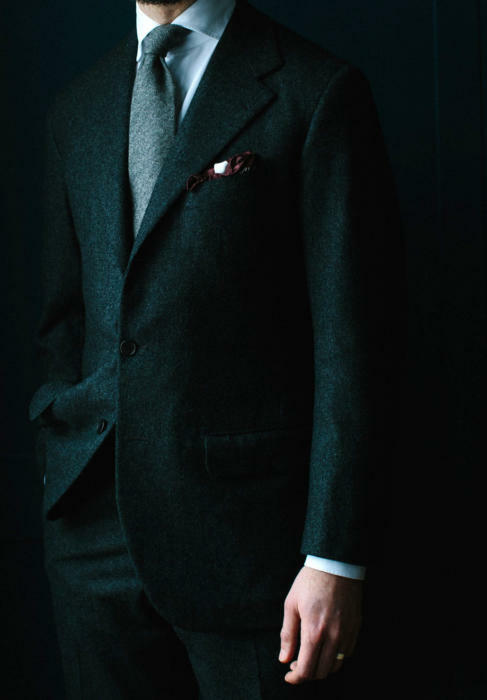 A grey tie is a bit more of a fashion look (grey on grey), but a navy tie is also nice and charcoal flannel is great with deep, rich colours like purple. I also find that it compliments a blue shirt with a burgundy tie, or a bright acidic colour like lime. Here, I have that burgundy in the silk handkerchief (from Huntsman), while my Jaeger Le-Coultre watch with tan ostrich strap also adds a little colour. 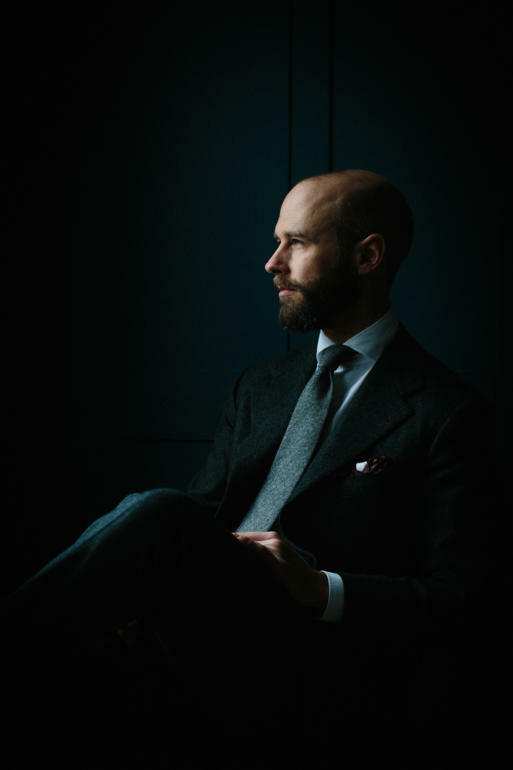 You can follow the discussion on Sartoria Vestrucci charcoal-flannel suit: Review by entering your email address in the box below. You will then receive an email every time a new comment is added. These will also contain a link to a page where you can stop the alerts, and remove all of your related data from the site. When would you wear it? I think charcoal is a very formal color but the flannel makes it less so. I’d wear it for business – this is dark and smart enough for most work environments I think, though certainly not all. ………or with a black polo neck and black suede shoes for an evening at Ronnie Scott’s………….. I was at Ronnie Scott’s a few weeks ago. Somewhat disappointed to be honest. Any other jazz clubs in London that you’d recommend? I like this suit but I think that would look a bit too Parisian existentialist for my taste! Interesting. I have a pair of charcoal flanell trousers (Ariston bunch) that I ordered from Saman Amel to have some contrast with a midgrey jacket. I rarely use them so maybe I should order a suit jacket in the same cloth. I’d be curious to know whether you feel a mid-grey flannel is too casual for a business suit. I’ve recently had one made and have worn it several times to the office/in meetings (it has been something of a saviour in the curiously wintry conditions the UK has been contending with during Feb/March) and it has gone unremarked. I worked in one of the leading City law firms and I can assure you that you would be very well dressed in this suit (actually a bit overdressed, lawyers do not dress that smart, not even most partners who of course could afford it). Same is true for Investment Banks although there some of the higher echelons are pretty well dressed. The idea that flannel is kind of casual is really outdated. Would a City banker wear it (apart from a private banker maybe)? Hmm – perhaps a note for consideration; : a dark charcoal shot against a dark background makes it impossible to distinguish one from the other. Thanks – noted below (published that comment first). Very nice, I love the colour. Is it Farrow and Ball’s drawing room blue? You’ve shot a dark suit against a dark background !!! One struggles to see the silhouette! Might want to republish this with photos against a white background . I think you have to note we view these on mobile devices with the brightness , often , turned down . Interesting point. If anything I think my mobile is brighter than my laptop, but noted. I second this request. I’m on a brightly lit Mac computer right now, and I still can’t make out any of the details or the cut. The photos alone are excellent, and the flannel looks fantastic in this moody lighting, but I can’t see the details of the cut that I’m reading about in the article. John, Vestrucci already travel to New York (and there are more PS readers in the US than the UK). They are also, as mentioned, planning on travelling to London. Perhaps closer reading of the article would have been helpful there. This is also a long way from being a bog standard suit. It’s a genuinely distinct style, cut superbly, that is stylish, comfortable and in some ways to last of a rich tradition in Florentine tailoring. If you want revolutionary tailoring, I suggest you try another website. David makes a very good point, one with which I have long pondered on this otherwise enlightening site; I live in North West UK and within 30 minutes of me exists not only many of the world’s finest textile mills but real, actual artisan tailors who never seem to get mentioned. For example, I can drive for thirty minutes to one of the numerous mills, select a fabric from their factory outlet, drive another twenty minutes to a third generation shirt maker who, if I take my own fabric can hand make a shirt in his own workshop for ~£80. In my home town of Liverpool there exists at least three tailors, one of which a recipient of Golden Shears award and the garments ARE actually hand made, on the premises, by crafts people each with the own specialisation and not, as almost always the case in London, farmed out to sub-contractors outside the M25. The price of all this genuine craft? about one third or less of London or Italian prices. The naval tradition persist here too and can be seen in their coating and overcoating craft. I am sure this state of affairs exists in other parts of the UK and I’m puzzled as to the prominence of London and Italy tailoring over that of provincial UK. Neil – I too come from Liverpool but have had suits made in Hong Kong, Naples, London and Tokyo without even thinking of looking at any options closer to home. Is there a simple way to get an understanding of who is who and what is what around the North West – a directory or similar? Despite the many comments about this issue over the past few weeks, I still haven’t heard anything to counter Simon’s point that regional tailors in the UK don’t offer anything different from their London counterparts apart from lower prices. Given Simon lives in London, where there are already many fine tailors, why would he travel to other parts of the country for something he can get in his hometown? I believe it’s a point of contention for those who see the value in bespoke, and would like to make the jump but either cannot yet afford the price-point, or see trouble justifying the price set by some of the more well-known artisans. I believe sites like this have been instrumental in putting tailoring back in the spotlight, but it has unfortunately spurred some side-effects as well. There is the influx from the insta-crowd and self-proclaimed master tailors that offer sub-standard garments at elevated prices, and possibly the inflation from actual master tailors who have become internet darlings. Some of us would like to know what affordable opportunities exist in our local markets, so that we too can reap the benefits of bespoke but without the mistake of being taken for a ride. I have a very similar suit made bespoke at Hayward about 5 years ago; I have had more compliments on it, from every age group, than all my other suits put together. This is an immensely sharp and flattering look with a white shirt. You can wear it anywhere. The photos are great but for the purpose of this website, they could perhaps benefit from a little work in Photoshop as on my PC it’s hard to see much definition. Thanks Jamie. Do you think a lot of that attraction is down to the slightly unexpected texture in such a formal colour? 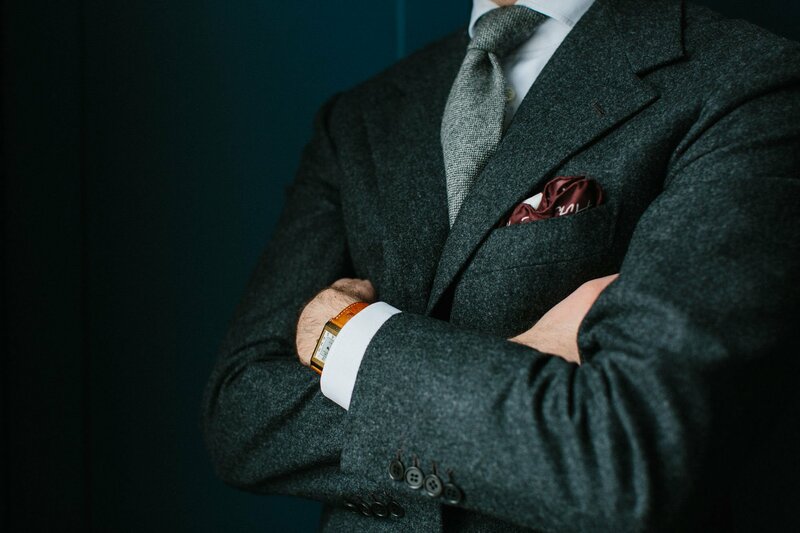 I think the compliments arise from seeing dark grey flannel cut so well, coupled with the fact that one simply doesn’t see many men in grey flannel suits – there are plenty of separate trousers and jackets, but rarely suits in this fabric (perhaps school put people off!). The best bit is that most of the compliments come from well dressed millennials! A very stylish suit, lovely texture. I would love to try them but they seem very expensive when compared to neapolitan taylors and from your article the make seems more Solito level rather than Caliendo. Is it worth the money? I’d say it’s certainly more like Caliendo – on a par with any of the Neapolitans, just not with the French. Hard to say on the price, as you say it is pretty expensive. I think it would have to be judged on style for that extra amount. I appreciate that both Camps and Cifo indeed made top finished suits for you, but a few in Paris (tailors, clients) question the quality of Cifo finishings. several tailors said they would like to hire staff from Camps but not from Cifo. Do you not get the same feedback sometimes? I don’t understand the focus on finishing to judge the level of make? Understood. I’m not sure thats entirely true however, there is huge variation between how different tailors make as well as finish. In any given making process there are many ways of doing something, and tailors across the world pursue different methods with subtly different results. In Florence particularly coat-making is seen as the most sacred part of the tailoring process (in contrast to a pretty simple single-dart cutting block), and in some areas of make they actually go to greater lengths than almost anywhere else. Take their lapel as an example – they do a sub-1cm pad (some Savile Row houses are now up to 2cm) an inch out from the roll to give it the Florentine spring, then taped with a small fell either side, the outside fell catching a minuscule amount on the underside, before the excess is placed down above with a tiny hand seam catching just the canvas. The inside panel is then fastened, again in a more sophisticated way than elsewhere, prick stitched a fraction apart, before the edges are given an extremely fine fell (much smaller than in UK, and using a single strand of a whole thread) to melt the two panels together. No other tradition puts in this amount of handwork, and this is how they get their lapels so crisp they feel and look almost like paper (see work of Sartoria Corcos). There are instances of this unique level of care all over the jacket. They tend not to focus on finishing at large in comparison as they see it as entirely secondary to how the maker has made the cloth behave across the jacket when worn, which they (like many english/french tailors I’m sure) see as the essence of coat-making. In some ways their method and its order of priority is a purist’s comment on the art, drawing attention to the areas they see as important, while giving less to others they regard as needless and superficial. This sounds pretentious but its quite true…many consider finishing something different altogether, and closer to embroidery. In any case, I also disagree that their finishing is even that much worse than elsewhere. Their prick stitching is larger because it does its job better, whilst their lining fells are further apart as they believe that the less unnecessary stitches you have in a suit the better, giving it natural movement. For the same reason they would never dream of top-stitching a lining as the French do, which they would consider bad tailoring. Plus in some areas it is actually very fine, they use an invisible but very small embroidery stitch (up-and-down full needle) to fasten their welt for example, and another hand seam adjacent to it, as well as an embroidery stitch to hold down the jet excess. The corners across the suit might look soft in comparison to the hyper-structured English/French houses, but this is an aesthetic preference, any sharp point is seen as poor work, and maker’s compete over perfectly cleaning out and rounding edges, which can be just as hard. I’m sorry to go on and on, but I just I think the focus on finishing as a metric for level of make blasts straight past the subtleties of the art. Florentines really make with a lot of love and thought about the process, so being roped into the cliche of more slapdash Italian making vs finer English/French is I think unfair, and the simplification above of Cifonelli < Caliendo/Vestrucci < Solito (though not intended) is a bit ridiculous, as you may agree, and doesn’t do any of their work real justice. Very nice, Simon. I can see from the close up that the flannel has enough texture for the jacket and trousers to be worn as separates. (With other shades of flannel – blue, for instance, or tweed jackets.) For someone like yourself who has many pairs of flannels, etc., it perhaps isn’t necessary, but I’ve found my SB flannel suit from Drakes (Easyday, 2017) to be very versatile in that regard, and it can be dressed up or down easily. I think a charcoal suit is a great investment. Thanks for pointing me in that direction some months back, Simon. Thanks David, I’m pleased it’s been helpful. Personally I wouldn’t wear flannel as an odd jacket, though. It doesn’t have enough texture – I’d want some more variation in the colours, or a pattern. What about a navy flannel blazer? The suit is very nice and I indeed like the florentine style. I’d be interested to know what Tomasso’s expertise is for taking meassures. Is he a trained cutter oder tailor? Simon, This looks just fantastic. Once you’ve your basic stuff sorted out this is just the kind of beautiful commission – or purchase – that you ”need” to fully savour the joys of dressing well. There will always be situations and events where this will be perfect. Also there are different ways of wearing because it is quite neutral. It is one of those low key looking suits that the likes of Cary Grant always did so beautifully – and you just cannot help admiring how perfect it is. Love it! Now …. where’s that spare 5k? Certainly a very nice suit albeit I find the colour quite restricting. I’ve been tempted by a flannel suit for a while and think I’ll get A&S to make me a navy blue chalk stripe it will be easier to dress up and down. I don’t wear a lot of suits so they have to be versatile. Interesting David – I would have said a navy chalkstripe was pretty much as formal, and more associated with business. A mid-grey flannel, on the other hand, would be much more versatile than both. I’m genuinely not so sure. Leonard Cohen (RIP) used to sport one with an open necked denim shirt and it looked magnificent. The actual colour I had in mind is the same as Drake’s used in their ‘Every Day’ suit albeit in a higher quality fabric and, of course, with that unique A&S cut. Ferry comissioned one recently and it is knock out. Can you please be a little more specific in what you mean by “finer”? I really like this one. It looks like the buttoning point is a touch lower than on some other of your jackets? Works very well. This is a lovely suit despite your caveats. Presumably, it has become obvious to any PS reader, but worth stressing: finding out the right style that really suits one is actually a challenge. 1. For the same level of formality (and color), which fabric would you have picked for such a suit other than flannel? 2. Which kind of fabric do you usually choose for the lining of your suits (jacket and trousers)? Simon, why do you not use silk lining? I’m struggling to see the practical downside of silk in a comparatively warm suit such as a flannel. Me too but is Bemberg not natural? I thought it was merely a brandname for cupro. Don’t you think that twill or heavy hopsack could be worthy contenders? Sorry to open with a criticism but I second the comments re. image darkness, it is not only an issue of image brightness but more importantly an issue of an underlit subject (5 mins on photoshop or in any image editing app would help fix). The images are probably usable for GQ but, respectfully, I think you have a more discerning readership who seek out detail and are less impressed by the fashion palette of ‘mood’. Also taking pics into a corner is never a good idea – it gives a reference to the vanishing point which then guides the eye past the subject to the background. An addional plea for detail on the trousers (other than side adjusters), particularly on silhouette. This is so for any suit worn in a business environment as once at the office many people remove the jacket for comfort. Once again the issue of Italy vs. UK regional (North of London) tailoring has arisen. I sense a little frustration by you Simon but please bear in mind that this area has a population of nearly 20 million (nearly 29 million incl. Scotland and Wales). I lived in the Midlands for some years and found that, generally (excluding the City), people dress better in the regions than in London. The argument that the Italians travel or do US trunk shows (which is sometimes used) is a marketing point (many PS readers are US based) but not one that should not stand in the way of exploration of other regions or countries. I understand your points on the English cut being generic to the UK but elements such as quality, craft, the growing wave of new talent, naval vs. land tradition are, from a readers perspective, all worthy of enquiry. So please don’t forget the millions north. Many wish to be well dressed, may not be able to visit Italy but could visit one of the fine tailors in their region. Should you choose to explore this area I’m sure you would be met with enthusiasm and open arms. Apropos nothing much but a thinking point, I was arranging travel this morning and noticed I can fly from Liverpool to Naples in 2 hours for £44.00 rtn whereas a rail ticket for the same day to London would cost me £212 and take 2.4 hours. If I knew where to go in Naples I would make the trip as London is less accessible to most in the UK. Plus the food is better. I’m not sure where you are looking for your flights! You could get the train from Liverpool to London this time next month for £50 return (2hr 13mins each way). I can’t see any flight that are direct both ways between Liverpool and Naples regardless of the dates I look at. So unless you want a hellish 9 hour journey you’ll have a substantial transfer at one end on top of a flight of over 3 hours. Even that is going to cost at least c.£300. Given that regardless of where you are getting your suit made you’ll need 2 or 3 visits to the tailor unless you run a style website, are often in southern Italy or want to take a lot of holidays there I’m not sure travelling to a Neapolitan tailor is practical for someone in your neck of the woods. Frankly even as a Londoner I’ve winced at the cost and time implications of doing so when I’ve idly considered it. No – it is pefectly possible to pay that or less on Easyjet, nor does it require far booking. It is my misfortune to have to travel to London often, in point of fact I used to do business with a merchant bank in Savile Row and I can also fly to Milan and back for less than the cab fare from Euston to the Row. I lived in Bologna once learning the lingo, Firenze isn’t far but I found it dreadfully touristy and unpleasant. Never been to Naples. Anyone who travels to London on Business from this part of the world budgets it at £350-£550 for the day if you do lunch too. 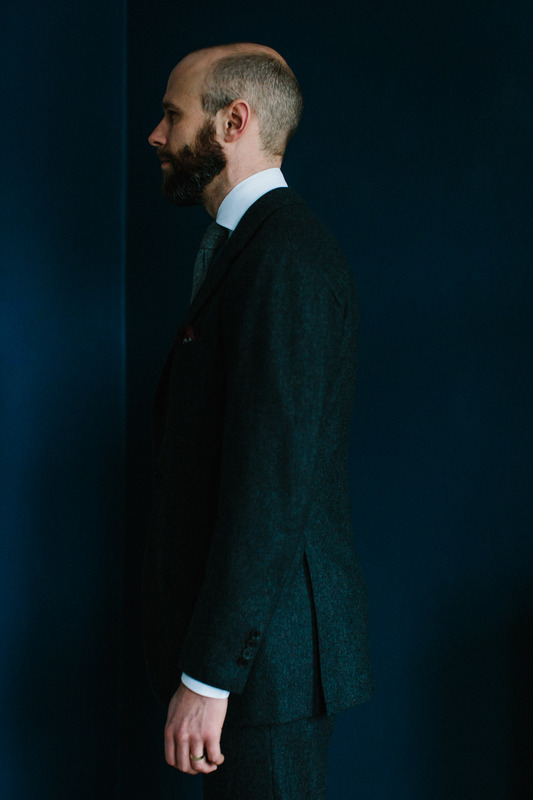 A really beautiful suit (bit moodily shot, as others observed) but what a clean cut and silhouette! Bit surprised about the questions regarding wearability in an office. I’ve worked in the City for 25 years, there are maybe 1% of offices were that would be ‘informal’ and many more where your ensemble would be at the formal end of the scale. Some posters seem to think we still wear black lounge and a bowler hat! In reality wearing a tie at all is already a minority option, for most jobs. I work for a top accountancy firm and Simon’s outfit here would be at the end of the formal scale. I also read a comment on Andreas’ post where the commenter said most of Andreas’ outfit would not fit in a office! When I look around in my office, Andreas outfits would just be fine, he’d be the best dressed there, even more so than senior people! As far as I can remember my days in a British ibk in the City, most suits were worsted (and even within Worsteds, chalk stripe was rare vs more formal pinstripes). I assume Simon’s fabric is carded. Yes, I agree JJ. I have a mid-dark grey flannel SB from Graham Browne and work as a lawyer in the City. Simply wearing a well-cut suit with a well-tied tie and clean shoes makes one pretty much always the smartest in the room these days, even if the suit is flannel. I have to say, I love flannel generally – it’s comfortable, warm, hard-wearing and interesting. Planning on a blue flannel for my next suit! I think it’s a nice suit, Simon. Though as the others have said, it’s quite difficult to see the details because the photos are dark. I’ve put the brightness at maximum on my laptop. 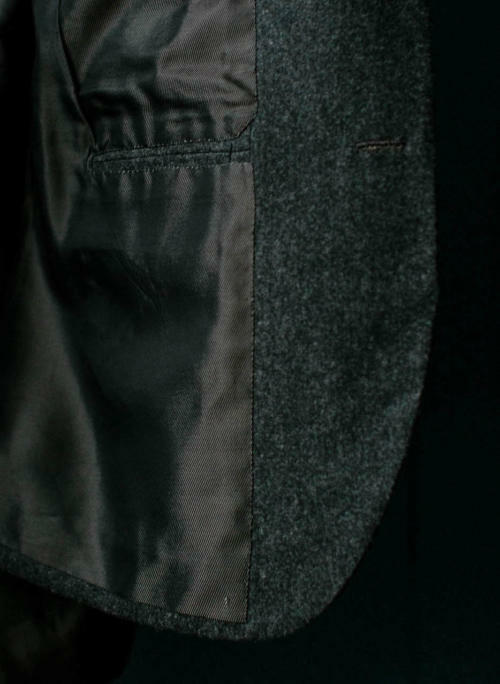 Another question, as you’ve compared the suit to Liverano, it the chest pocket in Liverano jackets straight or boat-shaped? Cheers. Simon, with it being the end of March, do you have a sense of how much longer you’ll be wearing this suit before you move towards spring/summer cloths? Depends on the British weather! How would the shoulders and chest compare to your W&S navy worsted both in terms of construction but also style and comfort? well i must say, I love it. I think it really suits you. Love the combination of material and colour too. Its a shame it is so far out of my price range, but lovely to look at all the same. Lovely cut and fabric (gray flannel all day). The concave lapel line throws off the balance of the jacket. 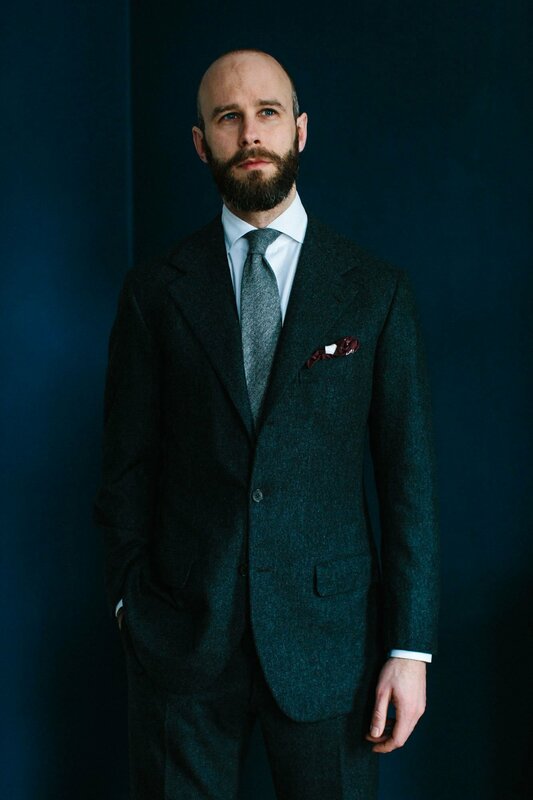 Because the lapel is so diminutive by the time it reaches the top button, the jacket shows nearly as little of the shirt and tie underneath as it would were the top button fastened (see top picture; compare with, say, the recent Sartorial Ciardi commission); consequently, the chest appears less prominent than ideal and the jacket looks less in fashion. This was a problem for me with my first few 3r2 commissions, though for some unidentifiable reason (any ideas Simon?) I do still always prefer it to a standard 2b, especially when not using worsted. I wonder if a more textured square would be preferable here. On the one hand, it’d maintain consistency with tie and jacket. On the other, it may seem too fastidious. 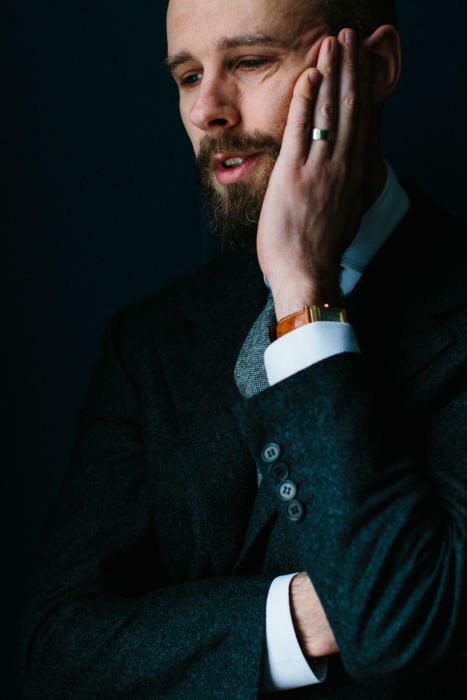 I know what you mean about the concave lapel, although I do like the natural feel of the roll – which is I think why I generally prefer 3-roll-2 on anything casual, even if less shirt and tie is shown. On the square, I think the rich silk was a nice counterpoint in terms of colour and texture to the rest, while still being formal. More often than not, this is a nicer combination – the tie and handkerchief having different textures rather than similar ones. So you don’t subscribe to the ‘shoes and watch strap to match’ edict? Like my father who when mentioned to him replied ‘so you wear metal shoes when wearing a watch with a bracelet?’! Overall a very good job with basic additional problems that you haven’t mentioned. The left sleeve has a vertical fold which suggests that the sleeve is pitched too far back and given your relaxed posture this has been a significant oversight. I am puzzled by the disparity between the cost of the jacket and trousers. Normally the break down would be two thirds of the cost allocated to the jacket and one third to the trousers. In general Tailoring circles this cloth, especially in a plain colour would have been regarded as an easy cloth. Given the standard of finish I don’t think that the jacket represents good value for money. I often feel that Italian Tailors treat cloth like this with contempt and I was trained by Italian Tailors and the results of that mind set show in the end product. Thanks for your views, although I don’t think you can draw clear conclusions such as these from the images (particularly these ones!). Certainly, the tailors didn’t treat it with contempt, quite the opposite, but they did say (and that has been evident in the wearing) that it is pretty soft for a flannel and moves a bit. Looking at the pictures and taking into account the lapel width. Don’t you think it would provide a better silhouette to the jacket if it was taken in 2cm on the waist? It seems to be a tad loose on the waist. Well, it might be more flattering, but no that would make it too tight on me and it would start to crease and obviously strain. Unfortunately my body is a limiting factor! Also, do bear in mind my points from Friday and having bespoke cut a tiny bit loose. This strikes me as the best fitting and most flattering suit I’ve seen you post (at the top with the navy Chitt&Morg). And I’ve been following for years now. It’s just judging from pictures and I know it has a lot to do with my personal taste on how I like suits to fit – but I’m just curious if you agree. Pitty the pic doesn’t show your sloped side which I’m curious to know if it turned out clean, did it? Simon: how would you compare Steven Hitchcock to Vestrucci in terms of quality and workmanship? Given the right cloth, do you think the cut and style of Vestrucci would be causal enough to be worn similar to Neapolitan tailoring (ie., jeans, trousers, etc.)? On the topic of Florentine tailors Simon, have you tried Francesco Guida? Beautiful fabric, can you give a little more info (weight/book/number)? I’m going to commission a charcoal flannel DB from W+S for next winter and deciding on fabric now. Initially thought vbc or Fox, but this H&S has a beautiful tone. Thanks. Did you ever locate the book/number for this flannel? Simon, this suit is simply outstanding! I really like flannel and can see my wardrobe having grey,brown, and blue suits in this wonderful and attractive fabric. I don’t know how I missed this article, but this suit fits you so well, one of your best. I like that the shoulder is only slightly extended which gives the suit a bit more masculine look. 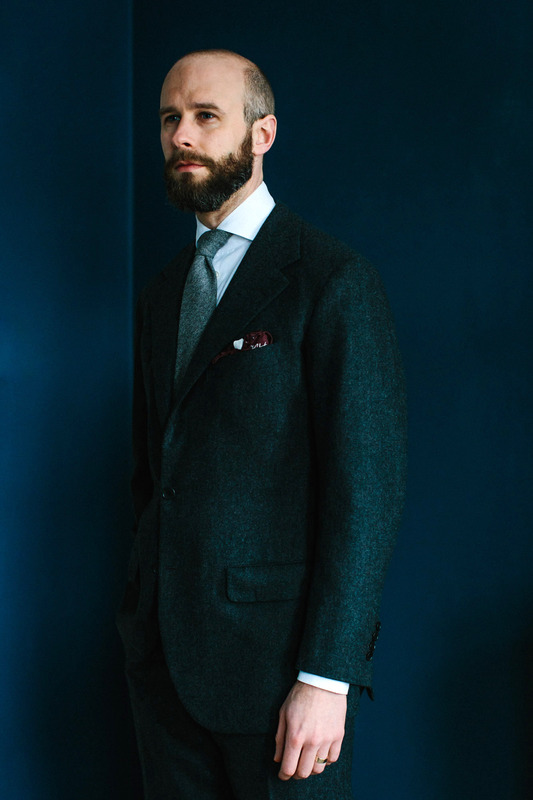 Thanks again for this excellent article and exposing your readers to Sartoria Vestrucci. I also saw the video and really like how the suits on both you and Tommaso move with the body. He is such an elegant man!